I won’t pretend that I can, or even should, review a Tanglewood concert of Mozart music. In fact, while listening to last Sunday’s All-Mozart Program, I began to write comments in my trusty “review notebook” just as I do when I watch theatre. I soon realized that my task was ridiculous. I ceased writing altogether. 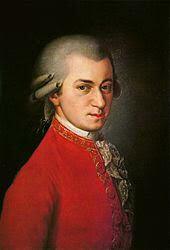 The music, not to mention Mozart’s music, “said” in its own compelling way, “pay attention.” I did. To some degree, I compare taking tourist photos to my writing a review. Most people who I know think that I’m wrong not to take a camera or iPhone with me on vacations. “Save the memories,” they say. Yet, and especially because one of my skills is not as a photographer, I leave the camera home. I would spend more time trying to frame a shot, check the exposure, and make sure of no passers-by, than I would actually seeing the view. Ah, but a photo brings back a time to reminisce. Maybe so, but those memories are with me as pictures in my head. Experiencing the supreme Boston Symphony Orchestra interpret three of Mozart’s well-known symphonies was with me, not just in my ears but in my pours, in my being there in the moment. Will I be able to hum the Jupiter symphony when I return home? Of course not. Will I be able to recite the number of each work; No. 39 in E-flat, K.543? Of course not. It’s been a long time since a course in Music Appreciation for me to even know what E-flat, K.543, etc., means. Yet, in reading the Tanglewood program, it was extremely interesting, and sad, to learn that Mozart wrote symphonies No. 39, 40, and 41 in a period of just two months. The little that I knew of Mozart’s history was that this boy genius, who died at age 35, was one of the most gifted and prolific composers of any century. Didn’t Mozart deserve the attention, away from my notebook and pen, for me to listen and love his brilliant talent? Yes.